Where to find Fort Erie hotels near an airport? Where can I find hotels in Fort Erie that are near tourist attractions? 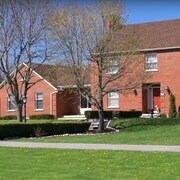 Fort Erie offers travelers and vacationers an array of comfortable hotel possibilities to choose from. Our database shows no less than 26 hotels within 0.1 kilometres (0.1 miles) of downtown Fort Erie. 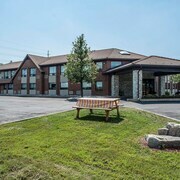 Accommodations that are in walking distance of the Fort Erie city center are the Comfort Inn and Howard Johnson Inn Fort Erie. 25 kilometres (16 miles) away from the middle of Fort Erie, is the Great Wolf Lodge , Ripley's Water Park Resort. Alternatively, The Mansion On Delaware Ave is located 4 kilometres (2 miles) away. The Ellis House Bed and Breakfast, Niagara Falls as well as the Lofts on Pearl are some alternative places to stay in Fort Erie. 25 kilometres (16 miles) to the west of Fort Erie is Port Colborne, home to the Port Colborne Country Club and Mud Lake Conservation Area. The LakeBreeze Niagara Bed & Breakfast and Knights Inn Port Colborne are some of the Expedia-listed lodging alternatives in Port Colborne. 25 kilometres (16 miles) to the northwest of Fort Erie is Welland, which is home to the Best Western Plus Rose City Suites and Canal Inn. Seaway Mall and the Welland Museum are just some of the more popular sites to explore when visiting Welland. 40 kilometres (25 miles) from Fort Erie is St. Catharines, a regional center with a population of 130,000, and the home of tourist attractions like the Brock University, The Pen Centre and the St. Catharine's Museum. You can also spend a little time at the Welland Canals Parkway Trail and the FirstOntario Performing Arts Centre. The Holiday Inn Hotel & Suites St. Catharines Conference Center and Four Points by Sheraton St. Catharines Niagara Suites are all great the hotel options in St. Catharines. Get your sporting fix with a journey to Meridian Centre, which is 40 kilometres (25 miles) to the northwest of Fort Erie. Those sports fans wishing to find a room or apartment close to the stadium can choose between the Springbank House and the Christine's Bed & Breakfast. Situated 16 kilometres (10 miles) away from Fort Erie is Buffalo Niagara International Airport. Stay nearby at Homewood Suites Buffalo Airport or Residence Inn by Marriott Buffalo Galleria Mall. What are the most popular Fort Erie hotels? Are there hotels in other cities near Fort Erie? What other types of accommodations are available in Fort Erie? Explore Fort Erie with Expedia.ca’s Travel Guides to find the best flights, cars, holiday packages and more!